We laughed so hard while reading comments on this post on Pioneer Press Facebook page. 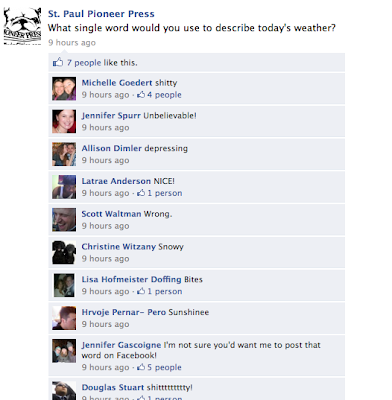 It is a simple question: What single word would you use to describe today's weather? Some comments are obvious, but some are just plain nonsense (read:awesome). Our favorite must be "Uncle". We have no idea where that one came from. Strong contenders for second and third favorite would be "TWINS" and "lamb?" I'm guessing "uncle" as in, "I surrender". I've pretty much given up too. i think the "lamb?" is in reference to march weather being "in like a lion out like a lamb"